Install and manage an on-premises data gateway to securely integrate a variety of cloud-based apps with your on-premises data and apps through Microsoft Flow. Microsoft SharePoint data gateways now support both HTTP and HTTPS traffic. The user name and password that you used to sign up for Microsoft Flow. Administrative permissions on a gateway. You have these permissions by default for each gateway that you install. Also, an administrator of another gateway can grant you these permissions for that gateway. A license that supports gateways. For more information, see the “Connectivity” section of the pricing page. You can create a gateway and an on-premises connection only in your default environment. In the upper-right corner of the Microsoft Flow website, select the gear icon, and then select Gateways. 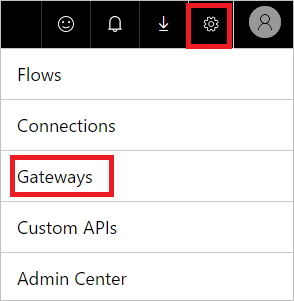 If you created or were given access to a gateway in PowerApps, that gateway appears in the My gateways list in Microsoft Flow. Run the wizard and provide the same credentials with which you signed into Microsoft Flow. After you register and configure your gateway successfully, it shows up in the Gateways list in Microsoft Flow. For more information, see Understand gateways.